The double A side “Because The Night”/”Heavenly” is out through Energise records on the 21st February 2019. Hazell says “Because the Night” started life as a backing track for my show recorded with my dear friend the late Clive Scott in the early 2000’s. The backing track never felt right, and it didn’t make it into the show, so it was shelved. In early 2018 Pete Ware and I started work on it again, after I suggested it to Energise for a single release. Pete and I have had our ups and down with this track – but I think we have nailed it now. It’s called The Dean & Ware Slappin’ Mix for a reason; If you listen to the chorus of this mix, we added a sound that to me sounds like a sharp slap across the face – you don’t want to be near me when I’m singing this live, as I can’t help but do the face slapping movement when I hear that sound. It always makes me laugh. “Heavenly” was originally written in the mid/late 1990’s. I was on a writing roll. I didn’t intend to sing the track myself but wanted it to be covered by another artist or band. I was introduced to a band called “Red Alert” who were a group of five Butlin’s Red Coats. The group name was changed to “Krave”. Pete Ware and I started to record with them, and “Heavenly” was of the tracks we did. Now here is the twist – I set up a meeting with Simon Cowell, (Yes THE SIMON COWELL – It’s not just Sinitta who has his phone number). Simon really liked the band, and interestingly during the meeting we discussed “Steps” and Simon quite candidly admitted that he had turned them down because he just didn’t “get them” (lucky for Steps, Pete Waterman did!). Simon asked me to set up a showcase where he could come and see Krave perform live (and they were really fantastic live). The band were performing all over the country at Radio events, Prides and under 18’s discos – everything was going so well until….I received a call from Simons P.A. and due to filming commitments Simon was unavailable due to his involvement with a new TV talent show – The X Factor. With hindsight, the band should have auditioned, but hindsight is a wonderful thing, and sadly the project fell apart and after a while the band split up. It has always been a regret of mine that I couldn’t help these guys more. “Heavenly” went back on the shelf, but it’s always been one that I kept going back to. 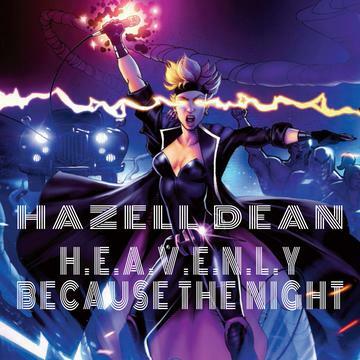 When we were looking for a 2nd track to go with “Because The Night” it was an no brainer, it had to be “Heavenly”.